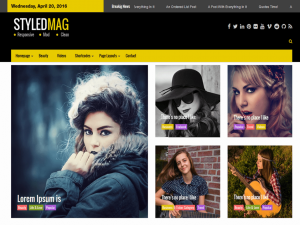 For anyone wanting an adult Magazine style website, Styled Mag is the one for you because of what this theme includes. You get responsive design, multiple blog layout options, retina ready graphics, several page templates, post formats, gorgeous typography elements, tons of widget positions, a custom child theme, WooCommerce support, Jetpack support, video tutorials, and more! Editors Note: Need to set up custom home page using template in order to get look and feel presented in the demo.